The market buzzes with a steady stream of chatter, shouts of vendors selling samples filling the air. People move from stall to stall, examining the size of lettuce heads and tasting fresh-cut oranges. It is Sunday, and the Palo Alto farmer’s market is open for business. Located on California Avenue, the market opens from 9 a.m. to 1 p.m. every Sunday all year, and has sold its organic products to the citizens of Palo Alto since 1981, yet it is still growing. Just this year, the market expanded into Birch Street, accommodating 25 new vendors ranging from fresh vegetables to baked goods. From handing out samples to browsing the stalls, the activities at the market beckon to people of all ages, including Palo Alto High School juniors Zach Levitan, Owen Staiger, Will Snodgrass, Maggie Peng and senior Heather Strathearn. 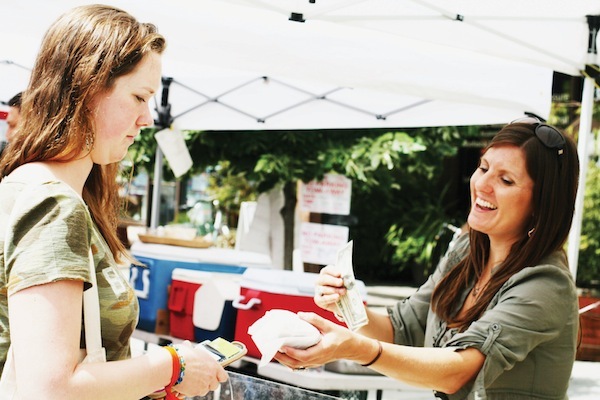 Senior Heather Strathearn, a weekly visitor of the California Avenue farmers market, purchases a carrot millet muffin from Rebecca’s Mighty Muffins, a Santa Cruz bakery known for its dairy-free, gluten-free and sugar-free treats. How did you get involved in the farmer’s market? What is your role in the farmer’s market? What was your favorite part about working at the farmer’s market? WS:“Getting the experience working, interacting with people and seeing everyone. Do you have a trick to giving out samples? What is a special memory you have of working at the farmer’s market? WS:“There was this one day where it was just absolutely pouring rain, and we had to set up the stand basically attached to the truck so it would not blow over, and there were not many people there, so we were just sitting there in the rain. What’s your favorite booth at the farmer’s market?